The Court provides evidence presentation equipment to any member of the bar practicing within the western district of North Carolina. This system displays evidence throughout the courtroom on monitors located on the judge’s bench, clerk’s table, witness stand, jury box, and counsel tables. Some courtrooms are equipped with TVs that display to the galley as well. Please note that this court uses the JERS system to capture evidence in the courtroom. Information on JERS can be viewed here. Training and testing sessions for this equipment should be requested well in advance as instruction cannot be provided on the day of the proceeding by either the courtroom or clerks office staff. Please use the links provided on this page to request training for courtroom equipment. An evidence camera, annotation monitor, control panel, and auxiliary connections for a laptop are standard equipment. • Annotation monitors are located on the witness stand and on counsel tables. 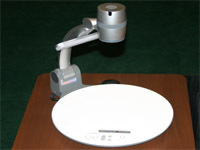 • A document camera is located on each counsel table. • Each counsel table is equipped with two monitors, a laptop connection, and an audio connection. Note that for larger trials, additional monitors can be added.